After much anticipation, my Oculus Rift (virtual Reality headset) finally showed up! 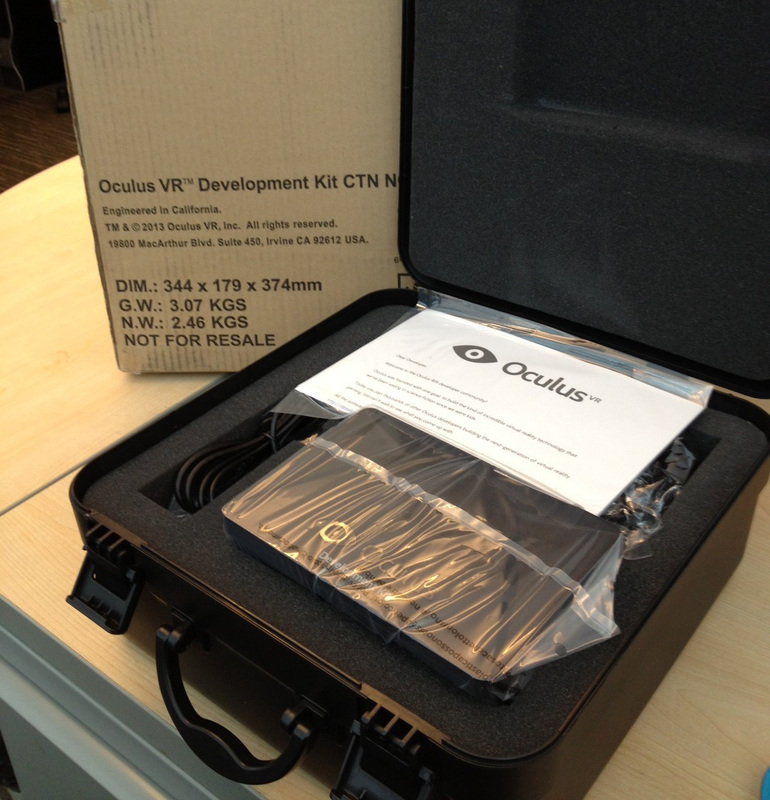 First off, the Oculus team spared no expense when it came to packaging. The unit arrived in a custom, foam-lined travel case, complete with just about every type of cable you can think of. Unboxing left me giddy with anticipation. The first demo I tried was the official Tuscany demo. I had tried the demo beforehand sans Oculus, so I knew what the model looked like, but exploring it in VR was a COMPLETELY different experience. I totally had that ‘WOW’ moment when I first put on the headset and looked around. I immediately felt as if I was transported to another world – very cool indeed! Even just ‘standing’ near a ledge overlooking a cliff got my heart racing. The level of immersion is impressive, and I can see how this is going to lead to some really interesting interact experiences. The next demo I tried was the Blue Marble spacewalk experience that was created by Jaywalkers. Very cool indeed! This was a great introduction to the Oculus Rift (perhaps a better start than the Tuscany demo). I’ve been somewhat prone to motion sickness before, but I was hoping to dodge that bullet with the Oculus Rift. While it seems like most people have been just fine in the Rift, there has been some who have been hit by motion sickness. While exploring the Tuscany scene, I was fine until I inadvertently strafed sideways. The unnatural movement combined with the lack of physical stimulation threw me off balance, and immediately gave me a horrible feeling of vertigo. I’ve only had a handful of sessions in the Oculus, and every time it leaves me feeling queasy for some time afterwards. Some demos are better than others – slower, more natural movements are good, and a fixed reference like a vehicle cockpit tends to help. As expected, the resolution was a bit disappointing (the Oculus team was upfront about the low rez displays they were forced to use). The display has a very pixilated, ‘shimmering’ look that has been compared to looking through a screen door. Higher resolution displays would help establish a high level of immersion, but the low resolution display works for now for development purposes. One last note – my condolences to the Oculus team for the tragic loss of Andrew Reisse – the lead engineer and co-founder of the Oculus Rift. It is such a senseless loss. A sad day for the VR community.